Some leaked Battlefield 1 gameplay of "The Runner" mission found its way onto YouTube (from a streamer, to VG247's Turkey outlet , to another YouTuber who gave it some minor edits for length) and now EA has pulled it down. Fortunately I was already working on a series of gifs to show you some new details about the mission, and those remain! As for the spaces between, it resembled a standard Battlefield multiplayer match: lots of scouting ahead, picking off enemies from afar, feeling a bit lost and then dying. Aside from the cutscenes, it was less cinematically crafted than the Storm of Steel prologue mission - which isn't a complaint. 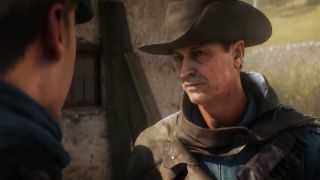 We'll see how all these war stories shake out when Battlefield 1 is released on October 21.